The Adventures of Zack and Mira is the story of two young children, Zack and his sister Mira, who become caught up in the unfolding drama taking place near their home in Israel where they live with their parents. Beginning with their discovery of the wild man in the river, one adventure leads to another as they see and hear the exciting events surrounding the One whom they come to know as Jesus. Interwoven within these ventures Zack and Mira learn valuable lessons of strong moral character, godly attitudes and responses, love and forgiveness, faith and salvation. The Adventures of Zack and Mira is written to encourage children of all ages to explore, enjoy, believe and apply to their own lives the truths and principles revealed in God’s Word. Parents and teachers will find review questions for each chapter for discussion and personal application in the back of the book. 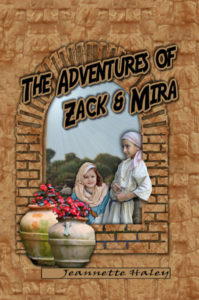 It is the author’s sincere desire that The Adventures of Zack and Mira stimulates young minds to search for and discover their own spiritual adventures, and relationship with the Lord Jesus Christ through God’s Word.